This lovely house was built in 1936 in the Cotswold style of Tudor Revival. The current owners are only the fourth since construction and the house is rich in original detail and features that they value. While their growing family presents some challenges, they are determine to stay and engaged aMortonDesign to help maximize living space and maintain the charming character of their home. We are fortunate to have archival blueprints, sketches, and construction photographs to reference in our efforts to make changes that are architecturally sensitive. The original home had an open porch on the west side which was eventually enclosed with screens. In the ’80’s this area was further renovated to enlarge living space and add a separate entrance for a home office. This entire addition will be reconstructed to provide a more appropriate roofline, the steepness of which will accomodate living space connected to the Second Floor. The exterior materials will be stucco with half-timber framing detail and wavy edge siding at the gable peaks in keeping with the Cotswold Tudor style. The primary program objectives are to add a second child’s bedroom and utilize the space at the addition for a parents’ bedroom with attached walk-in closet and full bath. Ceiling heights are low so we hope to raise them in line with the rafters wherever possible. 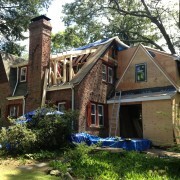 The existing dormer at the rear will wrap around the corner to engage the new roof of the addition. The complicated roof connections were studied in a SketchUp model. This tool was also helpful to convey the massing and form relationships of new to existing.